NBA free agency draws closer with each passing day, which means the rumors surrounding the major free agents will continue to swarm until moves start being made. And as the basketball world waits for LeBron James to shift the balance of power with his signature once again, there is a major player to (potentially) be had in trade talks. 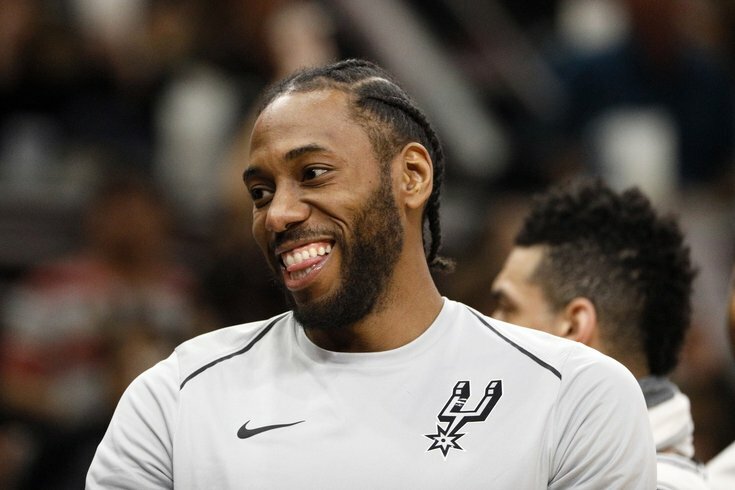 It's not exactly a secret that Kawhi Leonard wants out of San Antonio, and his potential movement could set off a chain reaction that factors into the free agency decisions for LeBron and Paul George. A new report from the ESPN trio of Adrian Wojnarowski, Brian Windhorst, and Ramona Shelburne suggests that pressure is beginning to build for the Lakers to go out and get Leonard, lest they miss out on luring other stars to Los Angeles. PhillyVoice previously reported the Sixers would be involved in trade talks for the disgruntled superstar, but the emergence of a formal offer is certainly a major development. Combined with Philadelphia's efforts on draft night to acquire an extra (and valuable) first-round pick from Phoenix, all signs point to them being serious about wanting to bring Leonard on board. There are important hurdles to clear before calling that a slam-dunk move, of course. The price of such a deal is important, particularly with Leonard's reported preference to play in Los Angeles. If the Sixers mortgage a significant chunk of their future for a player who won't commit to them long-term, it could set the program back for years. Even if Leonard does commit to Philadelphia, there are lingering questions about his health that will need to be answered in detail before the Sixers should feel comfortable investing in him down the line. Still, with Leonard in the fold, you can then go to other free agents — hey, LeBron — and point to a Finals MVP, elite two-way player, and a battle-tested veteran as the best player on your team and say, "That's who you come here to play with." His salary would complicate bringing in other big free agents, certainly, but generally, teams and players will find a way to make it work around the margins if it means adding another star to the roster. What's more, you don't necessarily need another star at that point. When healthy, Leonard is a top-five player and one of the few guys who can change the game on both ends of the floor. He can dominate a game with or without the ball in his hands, offer offensive versatility the Sixers don't have, and take on assignments up and down the lineup. Alongside Ben Simmons and Joel Embiid, that's a team that would be a no-doubt contender, assuming health. Leonard may prove to be an exception to the rule, but the value of stars on the open market is almost always overstated in preliminary discussions because they only become available in the first place due to things like the threat of leaving in free agency. San Antonio already had that looming over the franchise before Leonard's recent meltdown, and the posturing over L.A. takes things to another level. He may end up being a bargain when all is said and done. Sixers team officials offered no formal comment on this report, and are unlikely to tip off much of anything as they try to navigate an important summer for the franchise. But there's a heck of a lot of smoke building, and Leonard to Philly may yet be a possibility.